Black holes are some of the most intriguing and mysterious objects in the universe. Predicted by Einstein and portrayed in the movie Interstellar, many have waxed artistic about what black holes look like. Yet humans have never actually seen a black hole…..until now. The announcement was made via a press conference in Belgium, hosted by the European Research Council. Simultaneous press events will also take place in Santaigo, Chile in Spanish; Shanghai (Mandarin), Tokyo (Japanese); Taipei, Taiwan (Mandarin), and Washington, DC. (English). 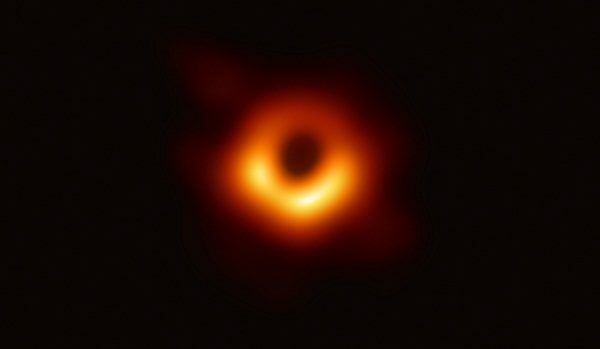 And of course, here is the image of the black hole, which is that of Messier 87, a massive galaxy in the nearby Virgo galaxy cluster. Messier 87 resides 55 million light-years from Earth and has a mass 6.5 billion times that of the sun and its picture was taken by the planet sized EHT (Event Horizon Telescope). The EHT Team, which relies on processing center to process the images for the black hole, are still as of the time of writing this article, working on processing the images of Sagittarius A, a black hole in the Center of the Milky Way Galaxy. A black hole is created when a large star collapses in on itself, leaving an object of almost infinite density. It is so dense that its powerful gravity is strong enough to bend light itself, hence the term “Black Hole”. 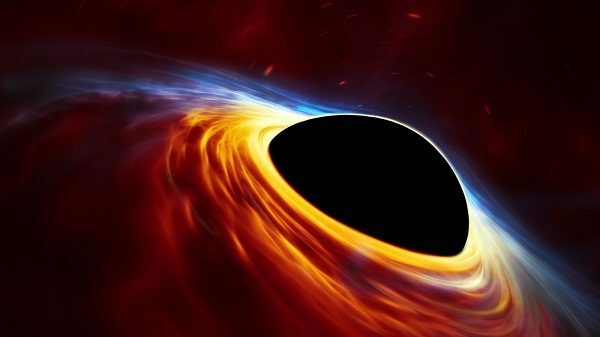 “If immersed in a bright region, like a disc of glowing gas, we expect a black hole to create a dark region similar to a shadow — something predicted by Einstein’s general relativity that we’ve never seen before,” said EHT Science Council chair Heino Falcke of Radboud University in the Netherlands, in a release. We aren’t actually seeing the black hole itself. At the center of a black hole, which Einstein referred to as a “dark star,” is what we call the singularity that bends all light around it once it reaches the event horizon. We are merely seeing its shadow. 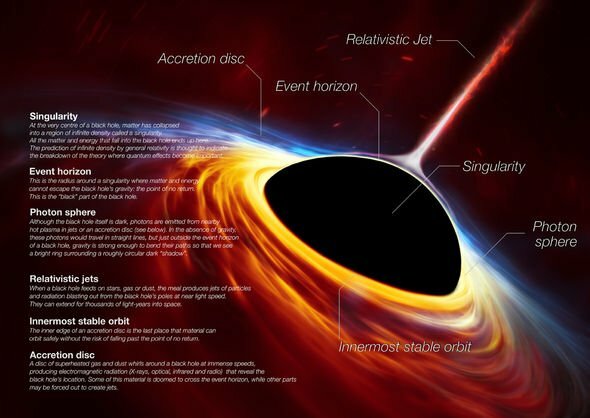 The singularity might not actually be black, despite this artists’ rendering of a black hole and its parts. According to Einstein’s theory of gravity, the singularity could be radically warping the space-time around it; in essence, it is hiding behind its own event horizon. Einstein’s calculations indicate that the laws of physics themselves could break down at the singularity, so what this core of a black hole, the singularity, looks like, is still shrouded in mystery. So what is the EHT? And how was this image taken? The EHT is actually an array of radio telescopes on different sides of the globe. They are linked to create what’s called a Very Long Baseline Interferometer (VLBI) the size of the Earth itself. The basic idea here is that radio telescopes in different locations are combining their signals to boost their power. This planet-sized observatory is necessary as while Sagittarius A is 4 million times as massive as our sun, it’s still really far away — a distance of about 26,000 light years. They are all precisely synchronized to collect several petabytes of data. The data, which was actually collected back in 2017, is then combined with the help of a supercomputer to create the first image of Sagittarius A. This is actually its shadow, not really an image of the black hole, as it pulls all light into itself due to its immense gravity. Albeit we have better supercomputers to process huge amounts of data, the Internet cannot move petabytes’ worth of information around the world on demand. Each EHT location stored its observation data on a physical hard disk. These had to be transported to a data-processing center and combined with data from the other observatories. To be fair, we have data from NASA’s Chandra X-Ray telescope, which detected the super-heated matter being pulled toward the event horizon, or perimeter of a black hole. Artistes used that data and produced this image. So now we have an army of scientists excited about looking at a black hole Messier 87 on the other side of the galaxy. Hopefully more telescopes will join the effort and help to sharpen the images of the black hole. We will soon see the black hole of Sagittarius A or at least its shadow from bending light from objects that fall into its event horizon. It is safe to say that the entire universe, or at least our fundamental understanding of the universe, hangs in the balance.